"Where street fashion and skate art come together." 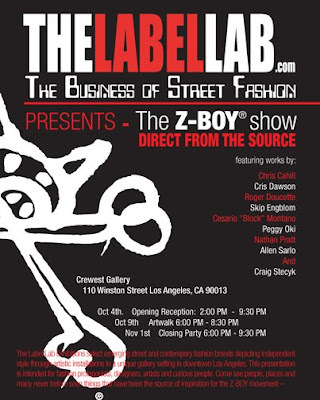 October 4th, 2008 from 2 p.m. to 9:30 p.m.
“The Z-Boy Show” will feature not only the Z-Boy brand of apparel, limited-edition T-shirts, and sneakers, but most importantly, their legendary troupe of Dogtown skaters and artists including works by Craig Stecyk, Chris Cahill, Cris Dawson, Roger Doucette, Skip Engblom, Cesario “Block" Montano, Peggy Oki, Nathan Pratt and Allen Sarlo. 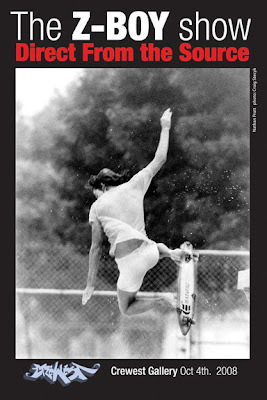 As part of the exhibitions opening day festivities, we will be closing down Winston St. for a Z-boy Block Party which will include live skating demos and signings by Z-Boys Paul Constantineau, Allen Sarlo, Chris Cahill, Nathan Pratt, Wentzle Ruml, Paul Cullen also, Paul Hackett, Christian Hosoi, Scott Olsen, Jesse Martinez, and more. With a custom auto show by Classic Lowriders Car Club and live musical performances by: Myk Mansun & Los Ninos de la Tierra, Gajah & Beond of Acid Reign, Mascaria & Nitendae, Nathan Nice, DJ Phys Ed, Swim Team, DJ Ethos, DJ Handprints, DJ Lx Boogie, Neila, Doobieman. *The exhibit will also be part of the Downtown Art Walk on October 9th from 12 p.m. to 9:30 p.m.
With a closing party on November 1st: 6 p.m. to 9:30 p.m. as well.